Welcome to Inscript Design: creating Rich pictures that communicate, inspire and engage, and providing Graphic facilitation for workshops, conferences and campaigns. Many companies and organisations use Rich pictures as a way of communicating complex and significant change to employees and customers. Rich pictures contain detailed visual metaphors and are highly effective communication tools. The process of developing Rich pictures is also a useful way to share understanding, tackle difficult issues and articulate strategy in a creative and informative way – producing Rich Pictures is an engaging way to create great communication. Redbridge NHS needed to explain their strategy to introduce Polyclinics into the area and explore the implications for both patients and primary health care professionals. The Rich Picture project for Redbridge NHS led by Atos Consulting was key to communicating this strategy. The process began with interviews with key NHS stakeholders, followed by workshops and meetings with patient groups and health care professionals. The picture was developed from many hours of graphic facilitation and live drawing with these groups. In the final Rich Picture below, the main image is of concentric circles around the patient at home. 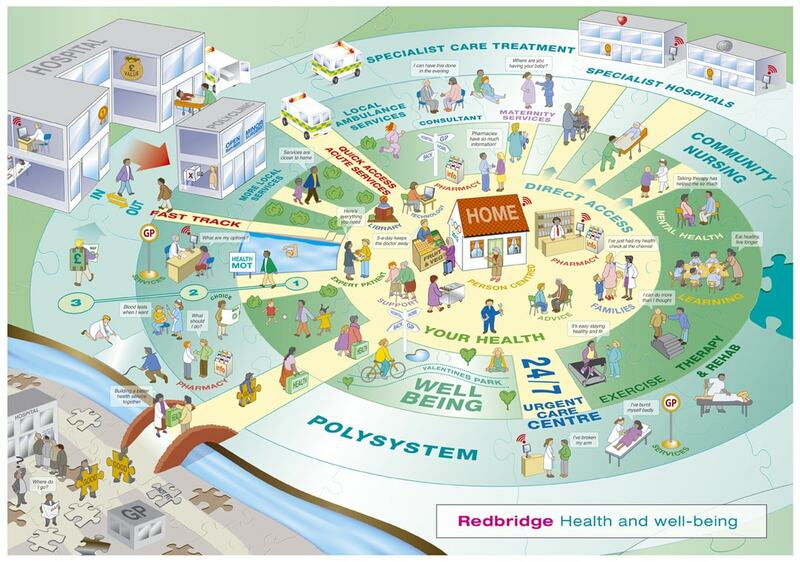 Around the home there are all the primary and secondary care services that Redbridge NHS provide. The ground is a jigsaw, showing that these services are organised to fit together. Patients carry ‘health’ suitcases, showing there is a level of personal responsibility when it comes to a patient’s own health. The benefit of the picture is that viewers can read or scan it in a few moments, but the level of richness allows a longer conversation that helps communicate other key messages. Redbridge NHS needed to engage with both health care professionals and the public about the changes they were making: Were the public and GPs worried about the introduction of Polyclinics? Where would they be situated? What services will they offer? The Rich Picture was highly successful in helping them get their message across to a wide range of people and to counter fears about the required changes. Graphic facilitation, sketch notes, scribing, visual listening or graphic recording is a way of visually gathering ideas, stories, concepts and metaphors. It is the basis for all Rich picture projects. David has developed Rich pictures for a wide variety of clients including the BBC, Barclays, BAE Systems, Centrica, Carphone Warehouse, Co-op, FSA, HM Gov, Imperial College, London Stock Exchange Group, MOD, MRC, NHS England and NHS Scotland, Sainsburys, Shell, Swiss Re, Oxfam, Procter & Gamble, Royal Mail, Rock Medical, TUI, Transport for London, Vodafone, and The Wood Group. David works direct with many clients but also with consultancies such as Atos, Booz & Co, PwC and ATKearney. If you are interested in discussing a project or wish to see more work please call +44 (0)20 8546 3462 or get in touch via the Contact page, LinkedIn or email.